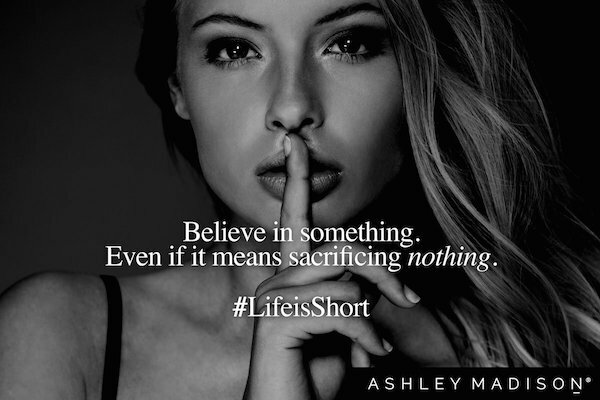 Ashley Madison, the notorious social networking service for affairs and discreet dating among married couples, has launched new marketing material that parodies Nike’s Colin Kaepernick ad. While the latter’s print dons the words, “Believe in something. Even if it means sacrificing everything,” laid over a black-and-white portrait of the former NFL player, Ashley Madison’s version, which now sits on a giant billboard in Chicago, reads, “Believe in something. Even if it means sacrificing nothing. #LifeisShort,” accompanied by an attractive young blonde. The print, made in-house by creative director Brian Offenheim, is apparently seeking out another home in Oakland, California. The brand wants to convince the public that there is a positive side to adultery and that, despite belonging to happy marriages worth preserving, these spouses wander into extramarital affairs that somehow help, and not hurt, the relationship.